1. I am feeling somewhat, mostly better. Still haven’t heard back from my doctor about the results of my bloodwork, and since it’s now 2pm on Friday, I don’t expect to. I have a follow up appointment next Thursday. By which point I’ll be feeling ship-shape, I’m sure. Hmm. 2. I think I’m about done Christmas shopping for the boys and George. That’s always nice. I wrapped a few gifts and put them under the tree, so now we are all festive ‘n’ stuff. 3. Speaking of Christmas, Maury-Frank is still “at the North Pole.” The boys haven’t really mentioned him in a week or two (I planned on bringing him out the morning after the boys’ party, but I was feeling like crap, and I forgot, and no one seems to care) so I could probably just get away with leaving him “at the North Pole” (the top of the closet in the playroom) but I think George would be disappointed. So maybe I’ll put him out this afternoon so they can see him when they get home. Otherwise I’ll forget again tonight and this cycle will just continue. I do suspect this is the last year we will be able to get away with the elf-as-behavioral-modification, so I may as well drag him out. 4. At the beginning of the month, we had the New Orleans Moms Blog holiday gathering. It was pretty awesome, because we got a ton of great stuff. 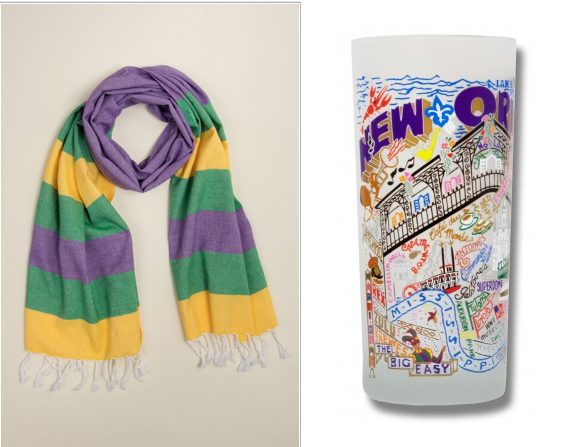 I’m really excited about my Mardi Gras scarf from Loomed (I’ve been wanting one for aaaages) and these glasses from Catstudio. So cute! Of course, I’m terrified to use them, I’m so clumsy.